An overview of Fibre Optic Cable, its advantages and how data is transmitted over Fibre Optics. 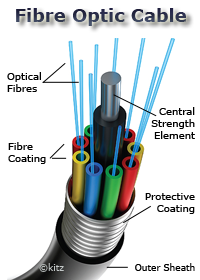 ~ What is Fibre Optic Cable? Fibre optic cable consists of one or more optical fibres. 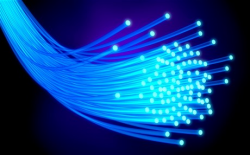 Each individual fibre is made from a very thin strand of glass which carry data signals using pulses of laser light. refractive index that keeps light trapped in the core. cladding against scratches which could cause light leakage. It may then be covered with a plastic jacket and/or bundled with other fibres to make up a larger cable. Various types of fibre optic cables can carry numerous amounts of optical fibres bundled together depending upon bandwidth requirements. Construction of the cable may also vary, for example some cables may have steel armour coating, whilst others may use kevlar yarns - or even a combination of both - depending upon where it will be used and the flexibility of the cable requirements. ~ What are the advantages of Fibre Optic Cable? Much higher bandwidth capacity resulting in the ability to carry more data and faster speeds. Fibre optic cable is less susceptible to interference than metal cables. Fibre optic cable is much lighter and thinner than traditional metal cables. Unlike metal it doesn't conduct electricity so resistant to EMI and RFI disturbances. Unlike metal it doesn't corrode nor subject to oxydisation. Fibre optic cable can carry digital signals unlike copper telephone cable which is analogue. Extremely low attenuation & negligible crosstalk between fibres in the same cable. ~ How is data transmitted over Fibre Optic Cable? 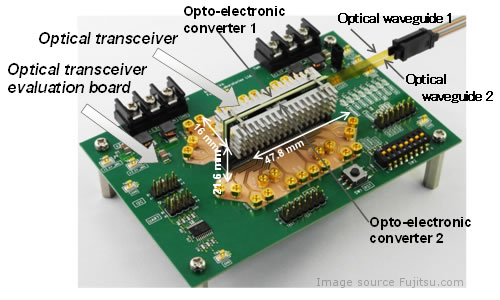 Transmitter - Converts electrical signals into light rays. Contains an optical source such as Light Emitting Diodes (LEDs) or Laser Diodes. Receiver - Contains an optical detector. Converts the pulses of light back to electrical signals. A combination unit containing both transmitter and receiver is called a transceiver. The transmitter converts electrical data into pulses of light which are beamed down an optical fibre. The ray of light is now trapped in the fibre core - light travels in a straight line - but if the light ray hits the wall of the core (eg if the cable has a bend) then the higher refractive index of the cladding reflects the light ray to keep it within the core. At the other end of the fibre, an optical detector converts the light pulses back into electrical data. Depending on the fibre type and wave length of the light ray it can travel hundreds of km without any reduction in power of the light signal. Attenuation is measured in dB/km. Repeaters and amplifiers can be used to extend reach even further. Single mode fibre is usually very thin and only allows one light ray to pass down the core. Data can be transmitted at a high rate of Gbs over hundreds of miles. Its thin core and single light wave eliminates distortion from overlapping light signals. Multi-mode cable can carry multiple light rays at the same time which means high bandwidth and high speeds. 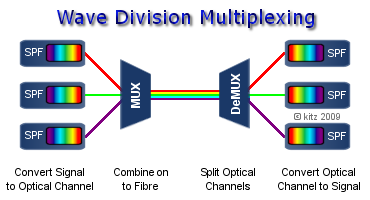 Multi mode fibre has a larger core and light waves are dispersed into numerous paths called modes. Each mode has a slightly different reflection angle. Unfortunately using multiple modes causes modal dispersion which spreads the optical pulse and weakens the data signal at the receiving end. For this reason Multi Mode fibre is seldom used over distances of more than 500m. BTw uses a combination of the following cables in their network : Remote Single Mode Fibre, Local Single Mode Fibre, Multi-mode Fibre 62.5 μm @ 850nm. Aqua jacketed cable is usually OM3 or OM4 (50/125) which are capable of 1Gbps @ 550/1000 metres respectively. As mentioned above multi-mode fibre cant be used over long distances due to dispersion, so its of no benefit for telecom backhauls and core networks which have to cover hundreds of miles.